Jurassic Fleet part 3, some finished vehicles. Yesterday was the third of my Jurassic Park twitch streams. 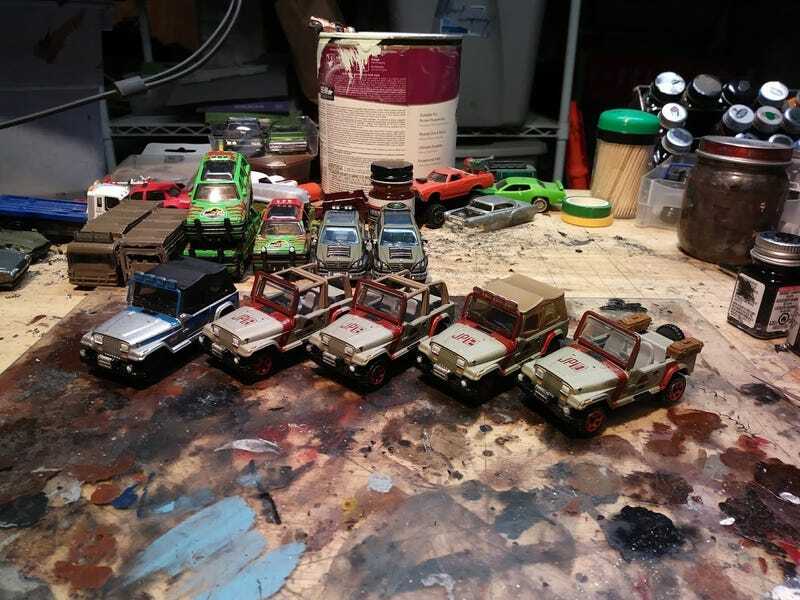 I was able to finish all the jeeps and Mercedes! Next up is the Explorers, and the RV. Though the RV is looking like a bigger project than expected. Jeeps 18 & 18, the Jeeps they first see the dinosaurs in. One will eventually become Jeep 29 when I figure out how to reletter it. Jeep 9. This didn’t appear in any movie, but it is a ‘93 Jeep in the newer Jurassic World color scheme. Two Mercedes from Jurassic Park 2, The Lost Kingdom. One was just detailed, and the other was turned into the pickup.